This spider is usually found around white or pale-coloured flowers where it is camouflaged as it sits and waits for prey, usually nectar-feeding insects. May also be found in vegetation particularly on the underside of leaves. 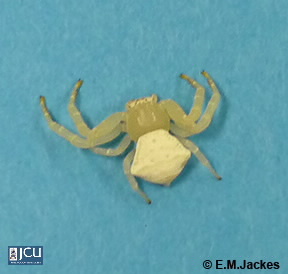 The distinctively shaped abdomen is white to yellowish with a few small darker spots. If it bites, it may cause some mild localised pain.